The objet consists of some elements. The material is one of them. We love our materials. We have some important points on the choosing the material that is if the materials will become to better state in using. You will find clearly our intention by the material LAMORA which is raw materials from Super fine Wool 75% / Angora 25% and which is our main material for Autumn & Winter collection. 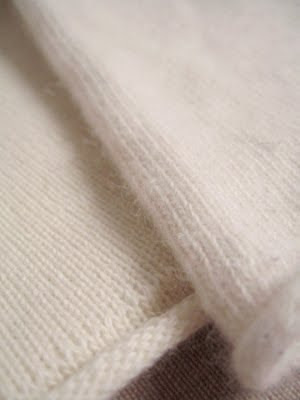 Angora is said to be the so warm material next to Cashmere. We certainly feel our products in LAMORA are very warm and we like therefore to wear always them during the winter. Many customers says our product in LAMORA is more warmer than others. The yarn of this warm material is a spun wool yarn in the types. The spun wool yarn is made from short fibers and is given a twist gently and non-uniformly. So we can get more softer and airier touch than a combed wool yarns. (the combed wool yarn is made from long fibers and is given a strong and uniform twist) And we give twist again while knitting. We can have therefore such a original material. Using and good taking care will make a soft touch and original fluffy feel of products in LAMORA. Though there is a trouble with this material that some people will have to remove the pills from your knit. But we really hope that you will do it as you take care for yourself, like a shaving, like taking care of your skin. We sure that you can always keep wear our products in best shape by your little usually care. Little usually care makes keep good and beautiful state in any objets and it brings affection you to those objets. Like this relation, we hope that all our product of MOTHER HAND artisan will be loved and always be your good partner. It's therefore a reason why we choose this materiel.